Lost your memories stored on your SD card? No worries, help is here to get all your deleted photos & video from SD card. Nothing could be more terrible and excruciating than losing the precious memories that you stored on your SD cards, like pictures and videos of times, places, and people that you might never relive or revisit. You can lose your photos and videos due to accidental deletion, SD card corruption, virus infection, device formatting, or due to physical damage to SD card. That’s why you should always backup your data, whether it’s on the phone, camera, or PC. Backups are helpful in situations like this. • Accidental Deletion of Pictures: The user accidentally presses delete or format on a digital camera or the mobile device. • File System Corruption: if the file system of your smartphone or camera malfunctions, it can result in file system corruption, leading to SD card corruption and making data inaccessible. • BAD Sectors in SD Card: SD cards like the hard drive can have bad sectors with time. These bad sectors on the SD card are unable to store data. Thus, making the normal functioning of an SD card difficult and leading to inaccessibility of data. • Abrupt Removal of SD Card: A SD card if removed too frequently or violently when used on multiple platforms, can lead to issues. • Malware or Virus Attack: Such attacks on your storage device (smartphones) can compromise the data stored on the SD card. • Manufacturing Defects: sometimes manufacturing defects can also lead to inaccessibility of data. We always recommend users to take regular back up of their data. But since some don’t have any backup, we have explained few solutions that can help you fix your SD card and might help you in the recovery of your lost photos and videos. Remove your SD card from your device, whether it’s a camera, smartphone, or any other gadget. It’s important that you STOP using the SD card immediately if SD card is physically damaged, photos and videos are deleted from the card, or you’ve accidentally formatted it. Use a USB Card Reader or SD card adapter and connect your SD card to your PC or Laptop. If your SD card is cracked or if SD card connectors are damaged, don’t use any adapter; instead, jump to the final solution 5 to know what you need to do next. • Type cmd.exe in Windows search box. Right-click on ‘Command Prompt’ and select ‘Run as Administrator’. • Click ‘Yes’ when prompted, to grant Admin access. • Type command chkdsk X: /f where X is the SD Card letter. Alternatively, you can type chkdsk X: /F /X /R for the rigorous scanning and repair process. • Hit Enter and wait until ‘Chkdsk’ utility repairs the disk errors. 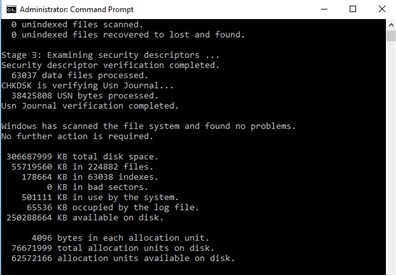 After Chkdsk process finishes, remove your SD card, reconnect, and check if you can access your SD card from File Explorer. If you can access your SD card, backup your photos, and videos and format the SD card. 1. Connect SD card and open the ‘File Explorer’. 2. Right-Click on the inaccessible SD card letter and select ‘Properties’. 3. Click on the ‘Tools’ tab, and then click ‘Check’. 4. Click ‘Scan Drive’. 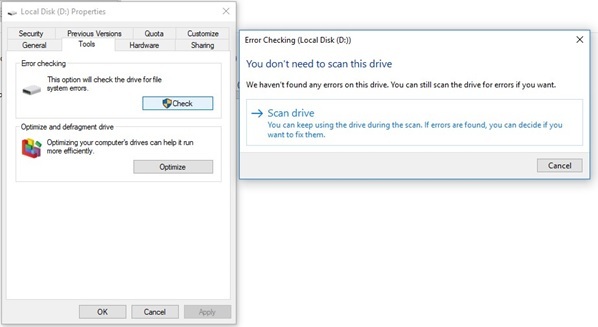 Error checking tool starts scanning your SD card for errors and if found, fixes it. After Error Checking is done, reconnect your SD card and check if you can access it via File Explorer. 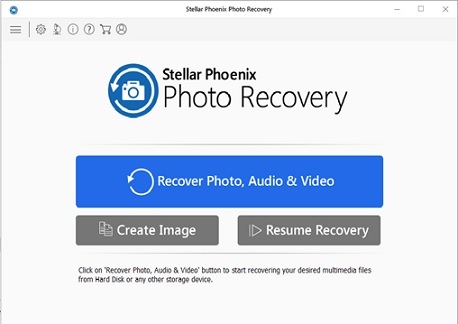 In this situation, you can take help of a professional data recovery tool like Stellar Phoenix Photo Recovery. The software is a great tool that can efficiently scan the problematic SD card for lost or deleted images, videos or audios with their actual names. You can download the photo recovery software from the main website. Download and Install the software using the downloaded setup file. Start by connecting your troubled SD card using a standard card reader, or you can directly connect it while the SD card is inserted into the device such as a smartphone or digital camera. This software can read your electronic device and the SD card inserted into it. Please make sure you have a spare drive, which will be used to save the recovered files & folders as the software will prevent you to save recovered photos on the drive that you are trying to recover data from. • After installing the software, click recover photo, audio, and video. • Check the previews to ensure you see the photos that you want to recover. • Click on desired files for recovery and ‘Recover’. • Mention the location that you want to save the recovered images/photos. Hopefully, the options mentioned above will help you recover data from SD card. If not, there are other solutions to opt for professional data recovery services. If your card is cracked or physically damaged due to moisture, and connectors are damaged, and if you are not able to retrieve photos & videos using a professional data recovery tool. The only way left is to reach out to a data recovery expert like Stellar Data Recovery, an ISO 9001:2008 certified organization, serving on data recovery from the last two and a half decades. It is a safe, reliable, and most-reputed data recovery solution provider, which ensures 100% data privacy. With the state-of-the-art infrastructure and ISO certified Class 100 clean Room Lab, Stellar Data Recovery can recover data even from a broken/damaged SD card. You can send your damaged SD card right away to SD card recovery service provider for analysis, and the company’s executive will let you know the complete diagnosis report comprising of data damage severity, recovery possibility, and how much data can be recovered from your SD card.